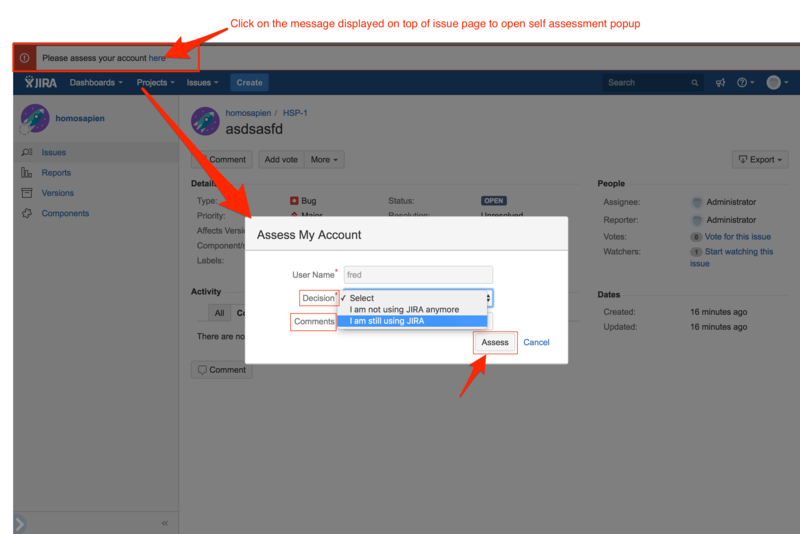 Apwide User Access Assessor add-on enables you to easily check which JIRA users need to keep an active account and which ones could live without it. It will help you a lot if you need to perform regular assessments of your JIRA accounts (ex : for compliance reasons). We have created this plugin to help our customers to save time and money, we hope that it will also help you. The plugin will scan all active users in JIRA and add them in an assessment queue. Each user in the assessment queue and logged in JIRA will be asked to confirm if he still needs access to JIRA. At any time, the administrators can assess user accounts. Note that the admin decision always overrides the user decision. 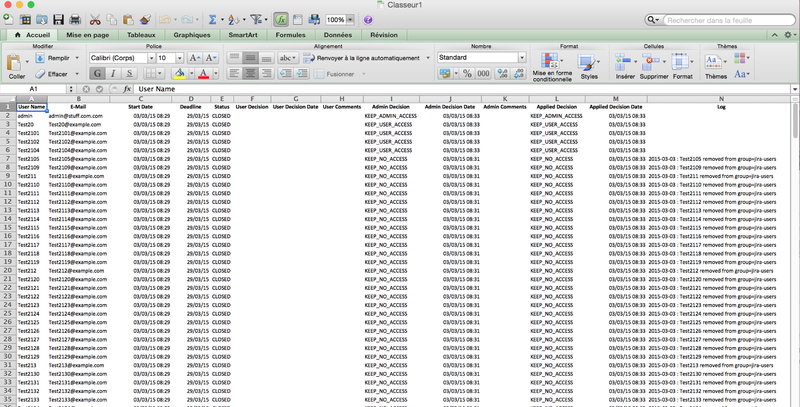 At any time, the administrator can check the status of the assessment campaign and extract the campaign data into an Excel report. Note that this report is also available for closed campaign. When all accounts are assessed, the administrator can close the assessment campaign. When an assessment campaign is closed, it is a good practice to generate a copy of the csv report in a safe place for auditability reasons. When a campaign is created, you can launch it. Launching a campaign means asking to all your active JIRA account to confirm that they are still using JIRA (= user self assessment). Launching will not fire any e-mail notification. it will just display a red banner in the issue page asking connected users to self assess their account (cf next step for more details). To launch the campaign, click on the button "Launch", the system will ask you to set a response deadline. Response deadline can be edited later on, as long as the campaign is not closed. This date is only informative. N.B. It can be useful to inform all your users by e-mail explaining to them that they need to assess their account before a certain date. The plugin currently does not support automatic e-mail sending, but you can easily get address e-mails of all users involved in the assessment using the built-in Excel report (cf below for more details). Each connected user will see a red banner on the top of the issue page asking him to assess his account. After the user has taken his decision, the red banner disappears. N.B. Assessment is a decision. No access right is changed after a user self assessment or admin assessment operation. Admin assessment overrides User assessment. For example, if a user wants to keep access to JIRA and the admin decides that he should not, the admin decision will be the applied one. N.B. Administrator is forced to assess explicitly all accounts with admin privileges. For standard account, admin assessment is optional. Closure of a campaign will apply the assessment decision. Ex : if admin or user has decided not to keep his JIRA account active, the group "jira-users" will be removed from this user. This user will be then unable to log in JIRA and his license is available to be used by someone else. If there are still user accounts that are not assessed, the system will ask you to assess the remaining accounts BEFORE closing the campaign. You have quick access to all accounts to be assessed from the To Assess tab. If all user accounts are assessed, decision will be applied to each user account and the campaign will be closed.